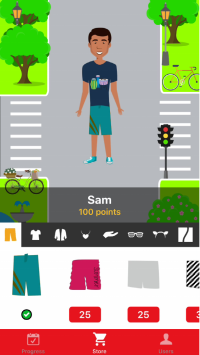 Once you’ve downloaded the app you need to create a user profile, enter your last injection date and then choose your avatar. You can create more than one user if you want to get reminders for more than one person. 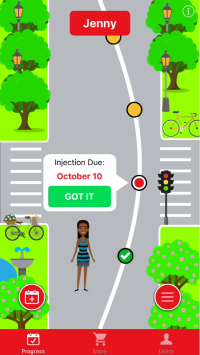 The app sends you notifications on your phone leading up to your due date and a reminder if you miss your injection. If you have an appointment booked you can enter this in the app, and it will remind you of your appointment date instead of the default count down, which is set to 28 days. You can also add a ‘widget’ to your home screen that will tell you when your injection is due. Every time you get your injection on time (between 21-28 days) you earn points which you can use in the store to buy clothes and accessories for your character. Once downloaded, the app operates off line and does not need internet connectivity. Who is Treatment Tracker for? 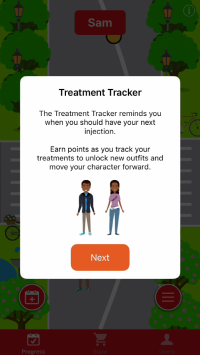 Treatment Tracker is a smartphone app designed to remind and encourage young people to get their regular benzathine penicillin G (BPG) injections to prevent recurrences of acute rheumatic fever (ARF). 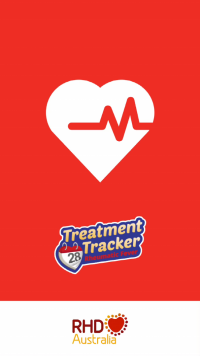 Treatment Tracker is a support tool, it is designed to remind people, on 28 day medical regimens, when their injections are due and to motivate them to get their injections on time. The app is designed to appeal to young to late teens on secondary prophylaxis and/or carers of young people on secondary prophylaxis. Why can’t Treatment Tracker be used for people on 21 day medical regimens? Due dates in the Treatment Tracker are calculated for people on 28 day medical regimens only. It is fine to use the app for people on 21 day RECALLS, which are common in many clinics now. There is an option for entering an appointment date which can be used to enter the recall date or appointment date if people find this easier. The app will not calculate a correct due date for people on 21 day medical regimens. How do people get their reminders? Once installed the app will provide pop up notifications on their phones. They get these reminders before their injection is due….. If their injection is overdue…. 3 days overdue: “Don’t put your heart at risk – get your injection today! Is the Treatment Tracker app linked to clinic data? No. Treatment Tracker is a self-management tool designed to remind people when injections are due. Reminders and injection dates are generated solely from the information provided by the user. We have made every effort to reduce possibilities of conflicts between the clinic records and recall systems but it is still possible. We emphasise that the app is a support tool only and clinic/medical advice should be followed at all times. Yes, you need data to download the app but once downloaded it will work when you have no data or internet connection. How much data do I need to download and use the app? The download will use about 10-15mb of data depending on the phone model. The amount of data needed to download an app varies depending on the app but common apps use anywhere between 5 - 15 mb to download. Once downloaded it works offline. Once installed the app occupies around 20mb of space on the phone. By comparison the Facebook app for Iphone takes up 223mb of storage once downloaded.